In middle school science, one of my biggest challenges is integrating meaningful reading activities that support and extend our science content. With my students at a wide range of reading levels, I’m always looking for ways to help them access difficult texts and build reading comprehension in science. One of my favorite reading strategies is “They Say, I Say.” I use this with anything from news articles, to Kids Discover Online texts, to poetry and fiction. Here’s how it’s done. The setup is simple: on the left margin of the text, students summarize the text (They Say), and on the right margin of the text, students make a connection to something they’ve learned or experienced (I Say). Here is an example I created from the Kids Discover article Nutrition for Tomorrow. The great thing about the Kids Discover articles is they are already chunked down into small sections. For other article sources, I chunk the article down into a paragraph or two at a time. This can be done simply by printing out the article and having students write in the margins. I prefer to copy the text into a Google Doc. (Tip: ctrl + shift + v will paste without formatting, keeping your formatting consistent to match your Doc.) Then, I can either print the article for students or post it to Google Classroom (create assignment > attach Google Doc > “make a copy for each student”). When I first introduce They Say, I Say to my students, I model the process in the first section. I will read the section out loud while annotating the text. Then, I ask my students to talk with their partner about what we could write for the They Say. We discuss their ideas together and come to a consensus on a They Say. Finally, I think out loud as I come up with my I Say, before filling in that column on my copy. For the next section, I turn more of the responsibility over to students by having them come up with their They Say, share it with a partner, then I ask a few students to share. Then we do the same with the I Say. As we progress through the article, each section moves a little bit quicker as the students get the hang of this strategy. Students enjoy reading and making connections to their experiences and find it easier to refer to the article in later activities. They Say, I Say can easily be paired with different reading and annotation strategies, including popcorn reading, choral reading, partner reads, reading in four voices, and think-alouds. 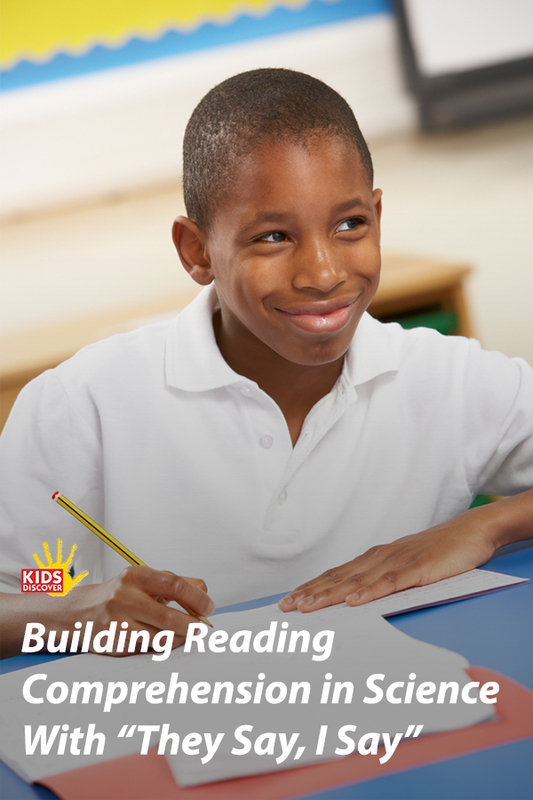 To make a reading assignment meaningful for students, it is essential to have rich after-reading activities. In my class, we frequently use Walk and Talks (read more here) to discuss the article, make additional connections, and ask questions. A Walk and Talk is a great opportunity to have students share their They Say and I Say with a partner. Students can use a variety of digital and analog platforms to synthesize what they read. Students can use their “I Say” column as a springboard for a personal reflection; try having students record a video reflection using an online video platform such as Recap. After we read multiple articles and examine additional resources (including labs, videos, primary sources, etc. ), my students enjoy participating in Socratic Seminars (read more here) to deepen their understanding and think critically about the topic. They Say, I Say is my go-to classroom strategy for building reading comprehension. We use it for almost every piece of text we read, and I find my students appreciate the reading scaffold as much as I do! What reading strategies do you use in your classroom?